Eye-popping new images from a telescope in Chile reveal a new look at the Seagull Nebula soaring through a cosmic unicorn in the night sky. The new nebula photos were released today (Feb. 6) by the European Southern Observatory in Chile's Atacama Desert. 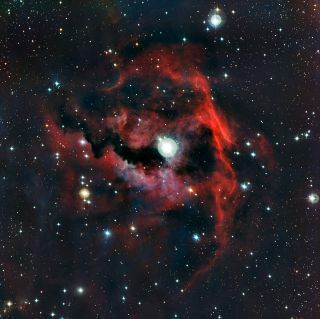 They show the Seagull Nebula as a wispy set of red glowing clouds amid dark black dust lanes and bright stars. ESO officials released a stunning video tour of the Seagull Nebula in addition to the new photos. The red hue of the nebula's dust and gas clouds, which make up the Seagull's celestial wings, is a telltale sign of ionized hydrogen gas, ESO scientists said. In fact, most of the Seagull Nebula is made of hydrogen gas, they added. "Hot new stars form within these clouds and their intense ultraviolet radiation causes the surrounding gas to glow brightly," ESO officials said in an image description. The Seagull Nebula's bird shape is actually made up of three different celestial objects. The nebula is officialy known as IC 2177, but the three clouds that make up its head and two wings have their own designations. "These objects are all entries in the Sharpless nebula catalogue, a list of over 300 glowing clouds of gas compiled by American astronomer Stewart Sharpless in the 1950s," ESO officials said. This wide-field view captures the star formation region of the Seagull Nebula (IC 2177), on the borders of the constellations Monoceros and Canis Major. This view was created from images forming part of the Digitized Sky Survey 2. The new ESO photo is close-up of the Seagull Nebula's captured by La Silla Observatory and shows the cloud making up the bulk of the seagull's head, a cloud known as Sharpless 2-292. "It shows only a small section of the nebula, a large cloud that is furiously forming hot stars in its interior," ESO officials said. The image is peppered with several bright stars, including a dazzling star that serves as the Seagull's "eye," they added. The Seagull Nebula is an example of what astronomers call HII region, vast areas of hydrogen gas that are primarily found along the outer arms of spiral galaxies like the Milky Way. HII regions are a clue that active star formation is still going on inside a galaxy, ESO officials said.